The road leading into the town was crammed with cars, camper-vans, caravans and horse floats. Hundreds of pedestrians were hurrying toward the beach. I prayed for knowledge and The Google God beamed down a response – we had arrived just in time for the biggest event of the year: the Gypsy Festival. In 15 minutes, costumed horsemen would ride into the Mediterranean Sea accompanied by thousands of colourfully-clad gypsies from throughout Europe to commemorate the moment where an Egyptian slave (Saint Sara) helped three saintly Marys to shore a couple of thousand years ago. I don’t remember hearing anything at Awatuna Sunday School about Mary Magdalene retiring to the South of France with a couple of girlfriends, but here was our chance to see the Gypsy Festival for ourselves. Did we have a lovely time? It was almost 30 degrees. The kids were hot and tired. They had already had a lovely time. They did not want to walk along a dusty road in a crowd to catch a glimpse of some statues garlanded with pretty flowers. They wanted ice cream and they wanted to go home. We looked at each other. We sighed. One of us may have made a remark. The other executed a slick seven-point turn in our enormous loan car, adeptly avoiding horse floats, cyclists, camper vans, ditches and gypsy maidens in frilly frocks. We drove north, against the traffic. The children did not appreciate the sacrifice. Small and Large were snapping. Medium was muttering about ice cream. One of us may have made another remark. 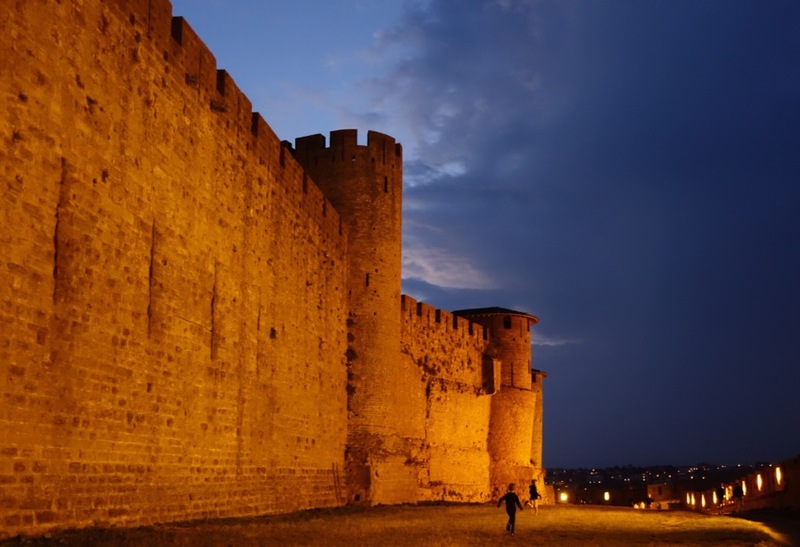 A few minutes later a large tourist sign appeared: Chateau Avignon. “Nooooo!” groaned three voices from the back seat. 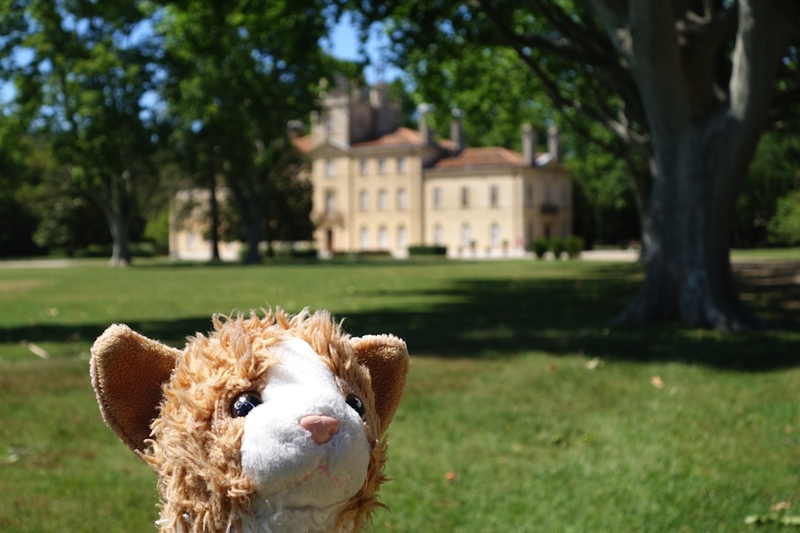 Sabbatical Man lurched the people-mover into the driveway where we caught a glimpse of a pretty chateau, beautiful trees and splendid, shady lawns. This looked like the sort of place where we could cool down and some of us could recover from the disappointment of not going to the Gypsy Festival. Small refused to get out of the car. Medium attempted an eye-rolling gesture which, on his inexperienced eight-year-old face, looked more like a mild seizure. Large expressed disapproval by loudly introducing atomic bombs into the verbal war game he was playing with Medium. The eldest two slouched out of the car and found sticks to bash around the roots of a beautiful tree while debating the pros and cons of uranium- versus plutonium-powered weapons of mass destruction. I took a yoga breath, glanced at my ungrateful children and started walking away toward the pretty chateau and beautiful trees. Then he and Large cracked themselves up so badly they both had to support their weight on their knees and find a shrub to urinate into. Luckily for their continued existence on the planet, I found this sarcasm amusing enough to scout for toilet cover myself. Because the trouble with being the children of parents living the dream is that it’s not your dream. Kids are not small adults. They cannot tolerate travelling at an adult pace. We knew this when we decided to take them to live in France for a year and spend some of our weekends and school holidays travelling. Yet I never seem to learn that if you pack too much in, your children will punish you so brutally that you will find the words “boarding school” leaping into your brain and darting out your mouth before you even realise what just happened. 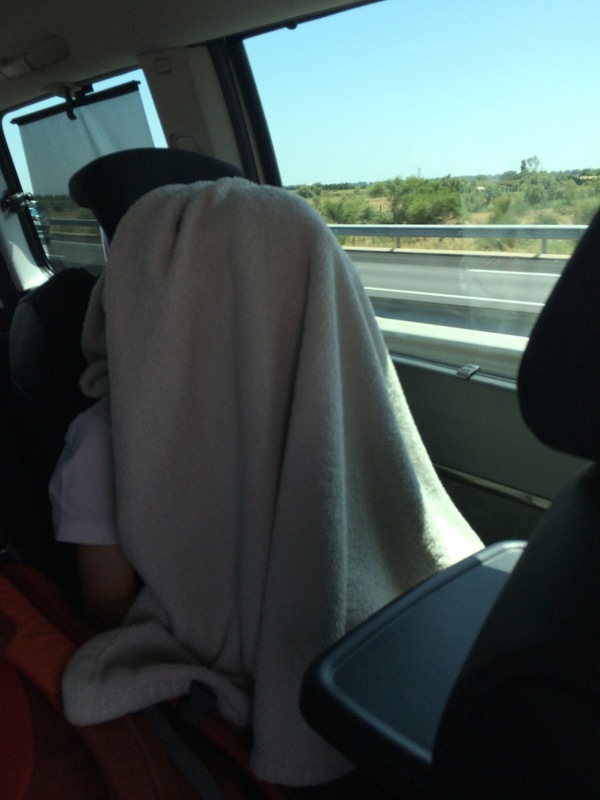 The ugly truth is that compared to traveling alone or as a couple who like similar things, travelling with three children can be a bloody nightmare. 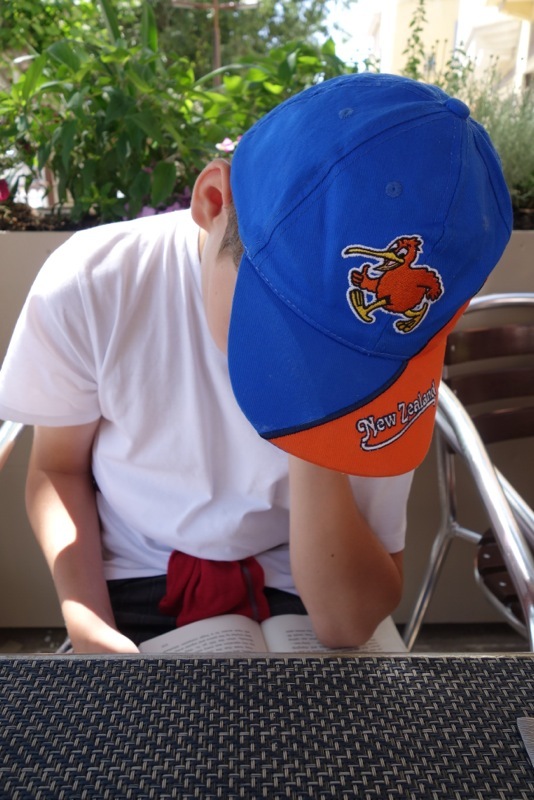 Maybe other people’s kids are different but my boys do not like early starts – particularly on weekends or school holidays. They do not like to gaze at beautiful scenery out of the windows of the car. A glance is all that is required to clock a mountain, a cloud formation, a bird of prey, a river, a field of sunflowers. They do not like to wander around markets for longer than it takes to find something they feel like eating. They do not like to walk around churches. They do not like to feel hunger and once they have felt it they will not think about anything else until they eat. They do not like to go into any shop that does not sell plastic fridge magnets and pens with floaty things in them. They do not like to go for a walk that does not have a point. They do not like to wait in a café for longer than it takes the waiter to transport the order to the kitchen. All of this means that parents – and this is bad news for seat-of-the-pants types like me – have to be organised. Spontaneous outings have a high chance of failure. You have to research travel times, interest to children and (most difficult for me) schedule activities around meal times. 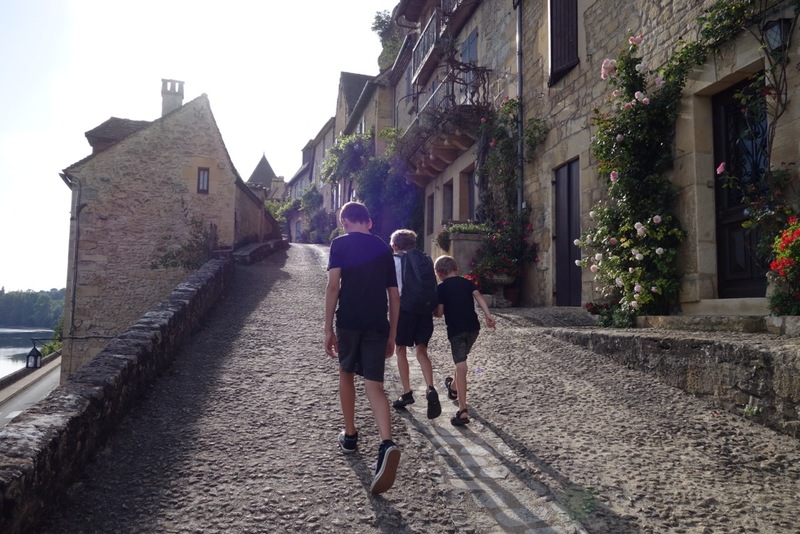 Kids will tolerate some mundane things like wandering through one of the Most Beautiful Villages in France but only if they know there is a trebuchet or a fake knight fight or an ice cream at the end of it. They’ll walk up a mountain if there’s a fortress at the top with real bullet holes. If you are smart, you will always lug around pencils and paper, a pack of cards and something to read so that if you get held up, the ferry ride takes longer than expected or you end up in a café, the kids don’t start tearing each other’s throats out or sucking sugar sachets and throwing the pepper around. As a wise friend once told me, kids really need down-time at home-base every day – no matter how tempting it is to keep going – or they will get tired and ratty. Most importantly, children will not necessarily appreciate things that impress you. It can be frustrating to cut short or miss out on wonderful experiences because your children are tired or fighting or just not that interested. 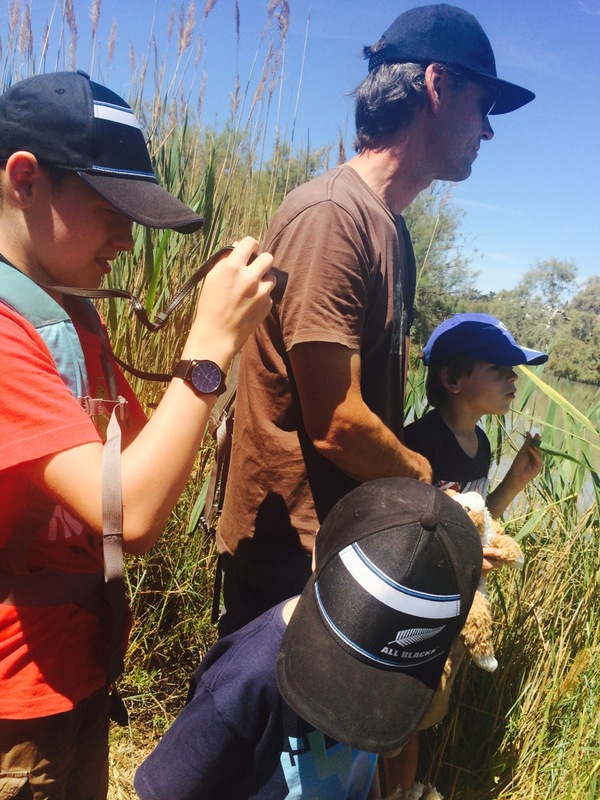 On the other hand, if you slow down and let children appreciate travel in their own way and at their own pace, you get to experience the gentler truth about travelling with kids, which is that compared with not travelling at all, it is brilliant. 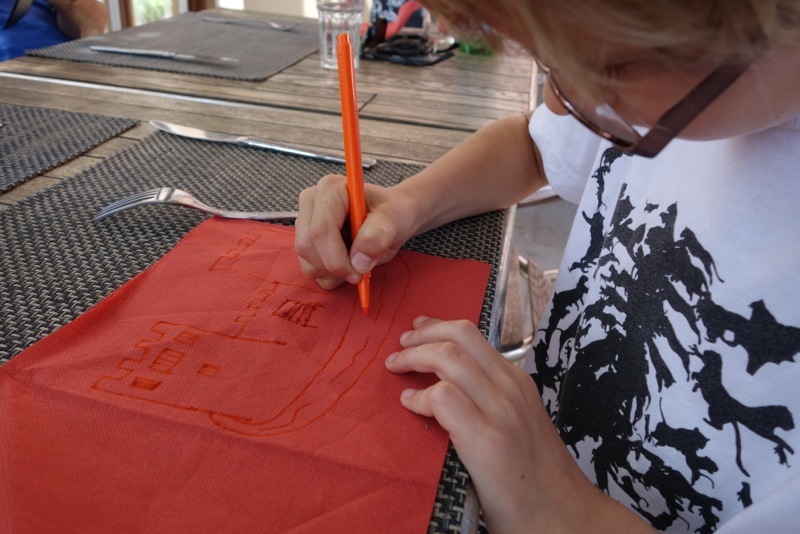 A 12km kayak down the Dordogne River with its fairytale castles and verdant landscape, was, for our family, not a peaceful drift down the river. There were Olympian bursts of speed countered with patches of trying to link kayaks and switch boats mid-river or push other kayaks off course. Food and rest stops were spent throwing rocks, making a dam, creating mini-rapids. Did the kids take in the scenery? Couldn’t tell you – but we did. Hikes may be more about “Who am I?” or “The Alphabet Game” than quietly being at one with nature – but at least you get to see the landscape and breathe the air. 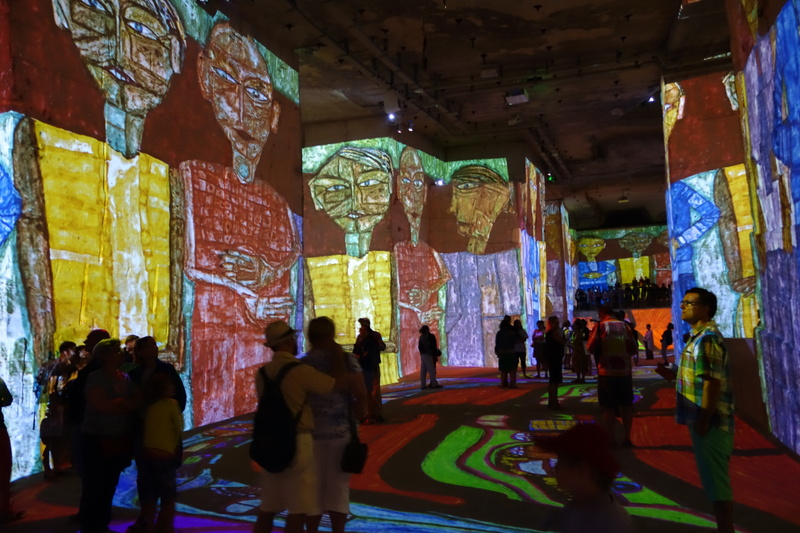 Children are also perfect museum companions. Like them, I’m not there for the urns. Let’s not waste time. Show me the mummies, the treasure, the biggest dinosaur skeleton, the armour of the King, the sword that took off the head. Sabbatical Man has a more methodical approach, which is why we always lose him while he’s conscientiously reading every information panel thoughtfully provided by the curators…. Likewise, the kids make castle tours interesting by carrying them out in an imagined state of warfare with bombs, arrows, pots of hot oil, “cannon-bombs” and the odd ballistic missile fired down on hostiles below. The toilets must always be examined so we can picture the soldiers sending their crottes down the castle walls to the horrified enemy. Sometimes experiences that start off looking doomed turn out to be wonderful. 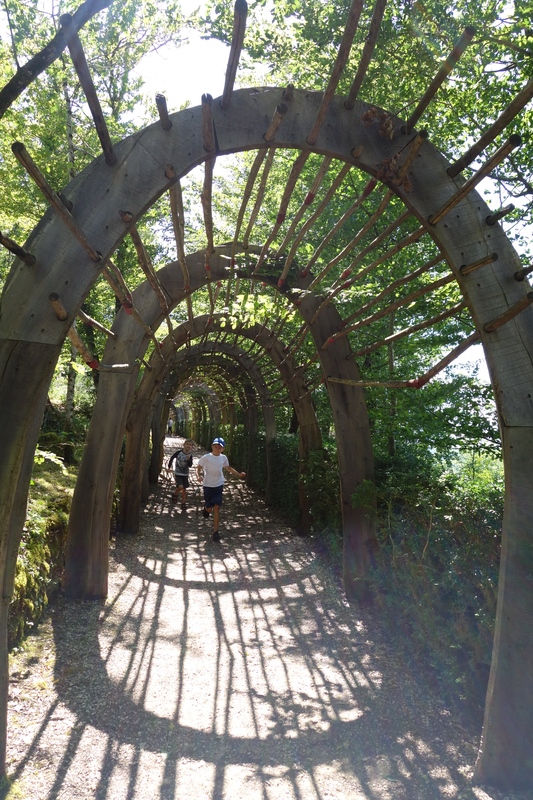 When we arrived at the celebrated Jardins de Marqueyssac in the Dordogne, a fractious Large announced he did not want to explore this magical place with its secret spaces, suspended maze gardens, tunnels, playground, tree hut, forest hike and spectacular viewpoints. He would rather sit on a bench and read his book. We decided that he was safe where he was, and left him to it. Meanwhile Small and Medium went wild. When we returned, Large was also in great spirits, having had a break from his family and seen nothing but his book and the view of the valley and its castles stretched out behind it. 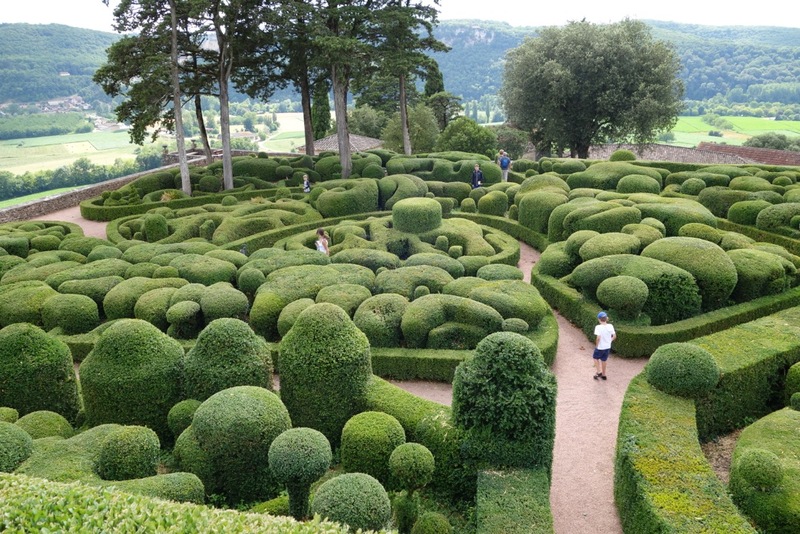 A week later, he declared the Marqueyssac Garden his favourite place in the Dordogne. One stormy day in a castle fortress also in the Dordogne, I thought the two older boys had lost interest and headed for the exit, only to discover they had found their way back to the cliff-top barricades. They were running around shrieking with laughter at the thunder, spotting lightning bolts across the valley and getting soaked (Yes the perils of the situation did occur to me, which is why I watched from the safety of a doorway). 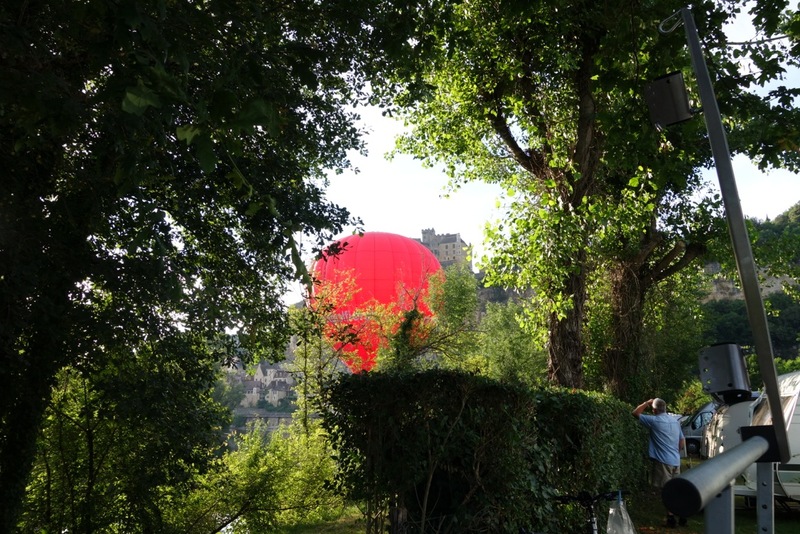 Another day, long after sight-seeing was over, we leapt to our feet to chase a hot air balloon that looked set to (gently) crash land in our camping ground at Chateau Beynac – only to see it lightly kiss the Dordogne River just metres away and take off into the twilight toward the castle towering above. 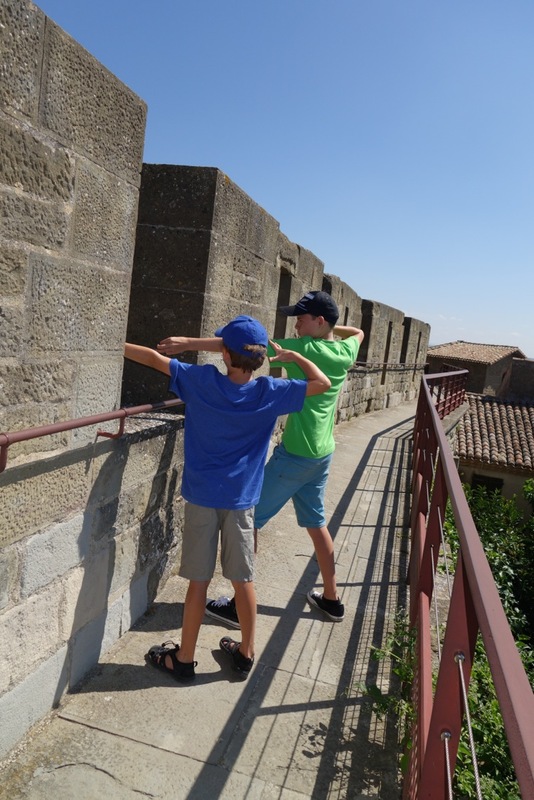 In Carcassonne we unwisely said “yes” to the boys’ request to explore the walls of the medieval city long, long after bedtime and spent the evening stumbling around perilous walkways, dark tunnels and mysterious corners, collapsing into bed close to midnight grubby, exhausted and elated. Do you know the weirdest thing I treasured on the Dordogne trip? It was the long walk from tent to toilet block in the campground. Most times I was walking with a child as both Small and Medium preferred not to do it alone and even Large sometimes felt like the company. “I’m going back stealth,” one might say – darting squirrel-like between bushes and making one elderly man roar with laughter at the joy of it. “Drop me at the swings,” the other might say. There was something delicious about being needed by the increasingly independent person at the end of the small, medium or large hand in my mine. “You must have done that trip three times already this morning!” laughed an English woman one day around 9 am. Maybe I was reading too much into the smiles of the many retired couples we walked past. I just couldn’t help putting myself into their shoes and feeling wistful. Exactly the same thought had crossed Sabbatical Man’s mind. We both know what will happen when this child-rearing phase of our lives is all over and we travel again on our own. We won’t remember the fighting or the frustration or the frankly bloody awful days. We’ll remember boys silhouetted by lightning on cliff-top barricades, a soft toy held up to a chateau, a midnight tour of a medieval city, a hot air balloon skimming a camp ground, a boy with a book flashing a smile. And we’ll wish we could transport ourselves back and live it all over again. Did you not make it crystal clear to your children at the start of this chapter in their lives, that in France unlike NZ it is perfectly legal for a parent to strike there offspring! Thanks for the information AJ – I will pass it onto the children because GOd knows none of the other threats work…. Thanks Barbara! Way too long but I just couldn’t cut it! Wonderful to read, made me laugh out loud (during a midnight feed) and get glassy eyed. Such great memories you’re making that the kids will treasure in years to come. Thanks for the lovely feedback and all the best for your travels!